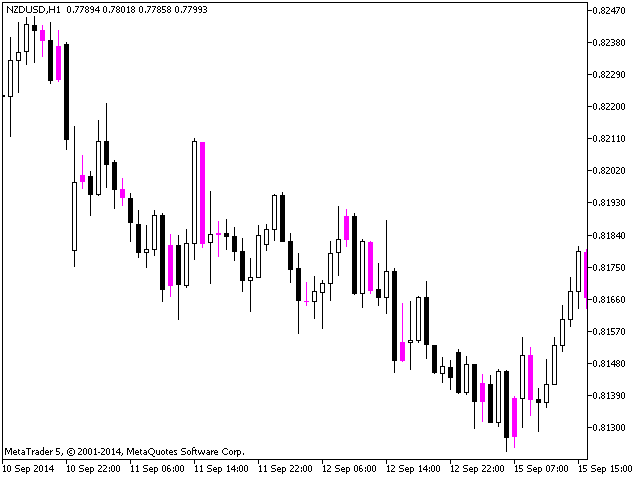 The indicator is designed to inform you about new Inside bars detected on any specified timeframes. Patterns found on the current chart are highlighted. The indicator can use alerts, email notifications and push messages to inform you. There is an extra option - a volume-based pattern selection criterion. This indicator automates the search of Inside bars and makes Price Action-based analysis of the markets much easier for you. Draw Mode - sets the way to draw patterns on the current chart (draw as bars or as candles). Pattern Name - defines pattern name in notifications. Enable Alerts - turns on/off sound alerts of the indicator. Enable Email Notifications - turns on/off notifications by email given in the settings of MetaTrader. Enable Push Notifications - turns on/off notifications being sent to the mobile client with ID specified in MetaTrader settings. 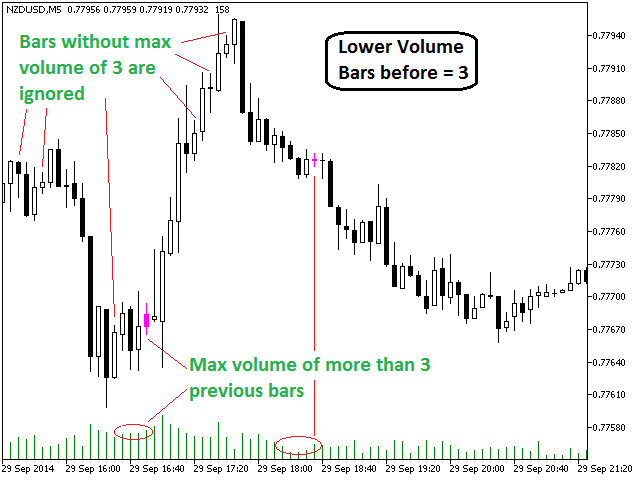 Lower Volume Bars before - specifies the required number of previous bars with lower volume comparing to the inside bar. The parameters from Min Bar Size on MN1 to Min Bar Size on M1 set the minimum required bar's range (distance between High and Low) for each timeframe. Bars with lower ranges are ignored. 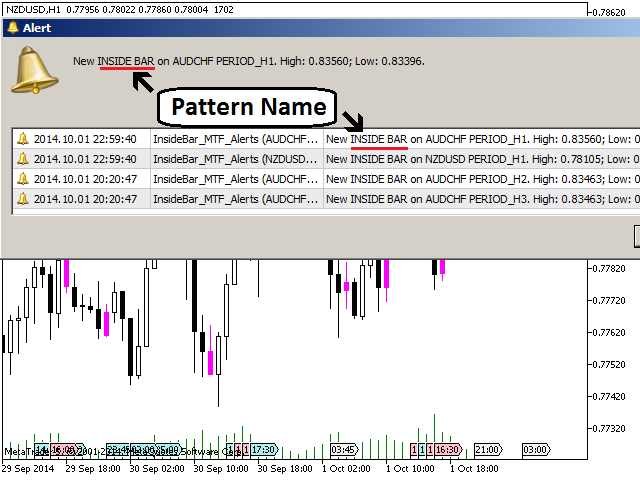 Negative value of the parameter disables pattern search and drawing of the indicator on the corresponding timeframe. The optimal values of the minimum required bar ranges are assigned and pattern search is disabled on timeframes lower than H1 by default. According to Price Action the trading signal of the Inside Bar pattern is the breakout of the borders of the inside bar itself or the previous bar. Stop Loss should be placed beyond the opposite border of the inside or the previous bar. To improve the accuracy of trading signals it is strongly recommended to trade only according to the trend direction. This approach reduces the number of signals but increases their reliability. Working on timeframes lower than D1, place the Stop Loss orders beyond the nearest extremum or the border of a trading range to avoid its premature triggering. The indicator provides settings for two colors. The first color is to draw buy patterns and the second one is to draw sell patterns. An inside bar is considered to be "bullish" if its close price is higher or equal to the middle of previous bar's range. Otherwise, the pattern is considered to be "bearish". This division is mostly tentative, so the same color is set for both types of patterns by default. But you may find this feature useful. 1. Moved to a brand new stable and extensible architecture. 2. 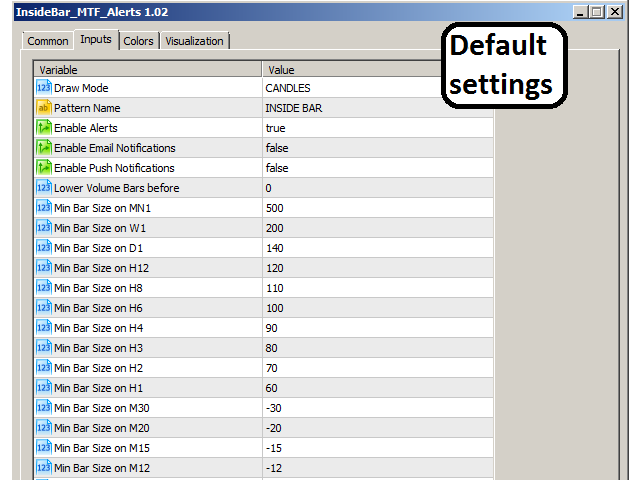 Notifications are sent only when a pattern is found or after MT5 restarted. It means, no more annoying alerts when you switch time frames. 3. Negative value of the parameter still disables the notifications for the corresponding time frame but drawing remains enabled with the absolute value taken into account. The bug with zero (last) bar is fixed. Now it will not be highlighted by mistake. The indicator now draws and sends notifications on any active timeframe. If you choose a timeframe on which the recognition is disabled (negative value of Min Bar Size parameter is set), it would be processed anyway and Min Bar Size would be an absolute value of the corresponding parameter. 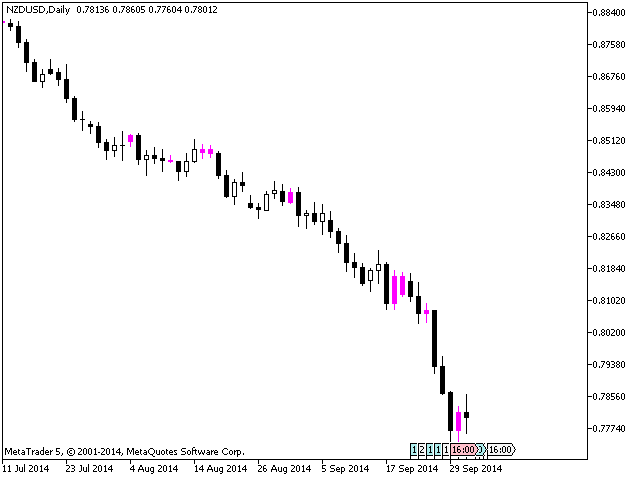 - Notify If MT Restarts - turns on/off notifications about patterns when MetaTrader restarts. - Remind of All Patterns - turns on/off notifications about all actual patterns on every new bar of the smallest chosen timeframe.